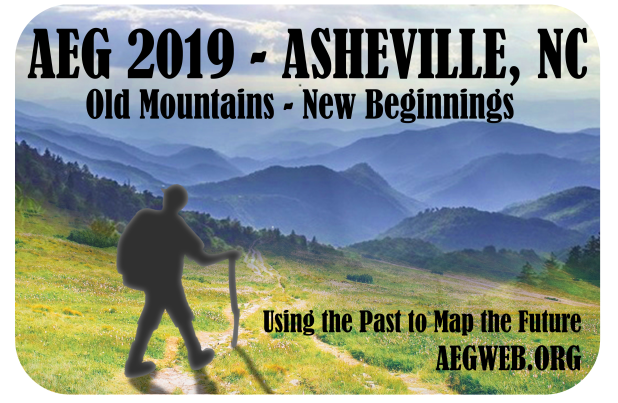 The Carolina Geological Society will host its Field Trip & Annual Meeting from Oct. 4-6, 2019 in Greenville, South Carolina. The topic is Sliding and Pushing to the South: Gravitational collapse of the Paleozoic thrust stack and later hinterland-directed Alleghanian back thrusting, Inner Piedmont, South Carolina & North Carolina. Trip leaders are Jack Garihan, Scott Brame and Bill Ranson. The Carolina Geological Society field trip in 2019 will focus on two new aspects of Inner Piedmont tectonic history in South Carolina and nearby North Carolina. Retrograde shear zones and their internal fabrics are interpreted to be the result of top-to-the-south gravitational collapse of the early-mid-Paleozoic thrust stack. The trip will visit the Mine Mountain shear zone in Standingstone Mountain quadrangle. Second, later hinterland-directed thrusting, inverting the normal structural stacking sequence of Six Mile thrust sheet paragneisses over Walhalla thrust sheet orthogneisses, is interpreted as the result of back-thrusting associated with an Alleghanian brittle thrust. Several exposures of the back thrusts will be visited on Sunday. An alternate Sunday excursion will describe the hydrologic conditions at the Cliffs at Glassy Community along the Blue Ridge Front.